The following FAQs apply to the Vistaprint referral programme. You can also look at the T&Cs for this programme. If you can't find an answer to your question, you can contact us. 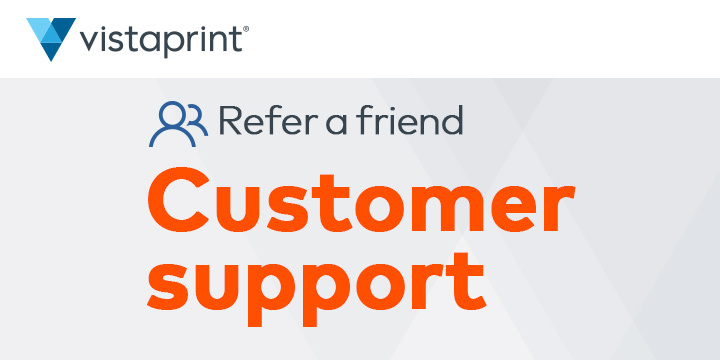 What is the Vistaprint Refer a Friend scheme? 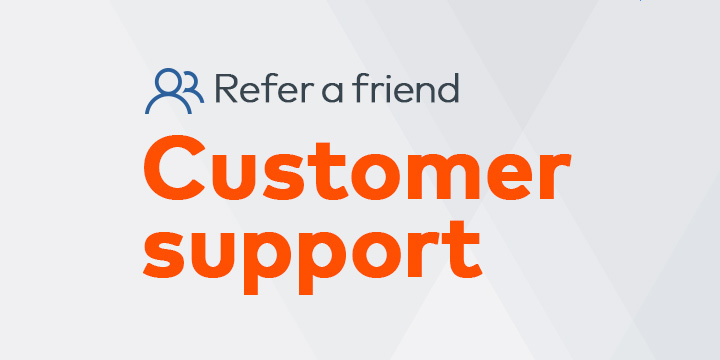 Refer a Friend is a scheme which allows referrers to introduce their friends to Vistaprint. If their friends place an order with Vistaprint of £40 or more (Inc. VAT, delivery cost excluded), we'll give the customer a £20 voucher code to use on their next order. How do I recommend Vistaprint? You can use our online form to register for the scheme. We'll give you a unique referral link (URL) that you can share with your friends via email, SMS, or social media. It links to the Vistaprint website, but identifies you as the referrer. You can also use the form to send the link to them in an email, or post it to your social media account. If your friend then uses the link to visit Vistaprint and place an order, following the terms and conditions, you'll be eligible for your reward. Am I able to use the same email address for the referrer and the recipient? No. We are unable to accept referrals where the same email address has been submitted for both the referrer and the recipient. How do we know when your friend has placed an order? We are able to track when the link has been used in the referral message you send them. We'll send your reward after they have clicked through and made a purchase. How will I get my reward and how long will it take? The £20 voucher code will be sent to you by email within 3 working days of their purchase. Can I send multiple referrals? Yes. You can share your unique referral URL with as many people as you wish. You can also send a referral using system-generated emails to up to five friends at a time. Can I make referrals using social media? Yes. As soon as you've registered for the scheme, you can share the offer on your Facebook or Twitter account, or via WhatsApp. Then, if any of your friends click on your link, follow the terms and conditions and place an order with Vistaprint, you'll get a reward. If they use a different device will their purchase be tracked? No. Your friend has to click the referral link and place their Vistaprint order using one device. By switching devices or not using the referral link provided, their purchase will not be successfully tracked and no reward will be issued. What should I do if I haven’t received my reward? Please check your spam folder – it could be we have emailed you but the filter settings on your account has diverted your reward away from your inbox. If more than 3 working days has elapsed since the recipient made their purchase and you are confident you haven’t received the reward, please contact us.